With 30 years of control and automation experience, Vantage, a leader in luxury control systems, provides owners with automation systems that give them the ability to personalize their environment effortlessly. 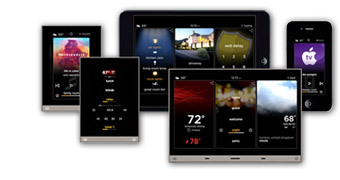 Sleek, on-wall touchscreens and an accompanying mobile app offer a consistent user experience across platforms that makes controlling lighting, audio, video, alarms, surveillance, and HVAC systems as easy as pressing a button or swiping to a widget. Vantage provides a simplified end user experience by controlling the complexities of luxury living and working spaces. Designed to seamlessly combine aesthetics and technology, Vantage systems, available in either wired or wireless format, give unprecedented control over every facet of life in luxury living and work spaces – from extraordinary lighting scenes to effortless comfort controls to thrilling theater installations. This creates the flexibility to include Vantage in new construction, expand a current Vantage system, or retrofit an existing luxury space to include Vantage. By combining elegant, simple user interfaces, sophisticated lighting control, award winning software, and industry leading integration partners, Vantage has truly become the premier automation solution for the luxury lifestyle. CLICK HERE to download the 2015 Vantage Product Catalog, (13MB). Based in Norwalk Connecticut, GT ELECTRIC is a fully licensed and insured, family owned and operated electrical contractor. For over 25 years we've been serving Fairfield County residents and commercial accounts with quality electrical services, working alongside some of the most respected local, general contractors including Wadia Construction LLC and RC Metell Construction Inc. GT ELECTRIC is a high-end residential and commercial electrical contractor with an outstanding safety record. Whether it be New Construction or Home Renovation, count on us for the finest in electrical services including home and office automation, automatic standby generator systems, climate control, interior and landscape lighting, home theaters including audio and video distribution, electrical service upgrades, swimming pool electrical systems, telephone systems, computer wiring and so much more. Our electricians are trained to handle all aspects of residential and commercial applications. At GT Electric we have both the knowledge and experience to meet our customer’s demands – and we do so with perfection. With a staff of 10 dedicated and dependable employees, some who have been with our company for over 22 years, we are large enough to serve you, yet small enough to know you. It is our hope you will consider us for your current or upcoming projects. Schedule your in-home consultation today by phoning us at (203) 849-1316 or, if after hours, simply click here to be taken to our contact form where you can leave us a message. We look forward to hearing from you. GT Electric serves most of the towns in Fairfield County, Connecticut and Westchester County, New York including Greenwich, Stamford, Darien, New Canaan and Westport.